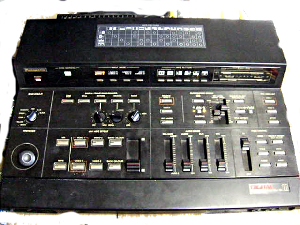 Years ago, I came arcoss a pdf posted on the VJ forums which explains how to modify the Panasonic WJ-MX10 video mixer to enable it to do real luma keying. Luma Keying means replacing certain parts of a video signal with another one, according to their brightness. Originally, the WJ-MX10 only replaces the chosen region with solid colours. While this might have been a nice idea for creating titles for your home videos, it can be quite limiting if you choose to use the mixer for more creative applications. The mod makes it possible to replace the 'white' background colour with a video signal coming from either one of the two sources. Interestingly, it does not only do this in the mixer's keying section, but also with the 'fade' section in the lower right corner, which means that it is now possible to fade from one to another signal while using wipes and keying effects at the same time. WoooP! I got the MX10 more or less only to see if I can do the mod and what it would look like. It looked very nice, and I probably would have used it quite a bit if I hadn't sold due to being a big and heavy machine and me having way too much stuff already in combination with a lifestyle too unstable to accommodate all of it. The mod is pretty simple and if you happen to have a MX10 and happen to know how to use a soldering iron, I strongly recommend you consider doing it. Otherwise, please feel free to contact me about modifying yours for a suitable amount of money. It has been a long time since I first came across the instructions, so their original location seems to have been down for ages. However, on a recent search, I found Matias Wilkman's Blog, where he not only rehosted the original pdf, but also did a nice article with pictures about the same mod and what the respective parts look like in real life. So if you think about having a go, this is your best place to start. When I first tried to sell it, I made this silly video, which in hindsight, is probably way too fast and confusing to actually be informative about the modification. I don't consider video editing my strongest skill, so I guess criticism here is well in order. This might also be one of the reasons the auction didn't quite end with the price I envisioned. Luckily, the seller turned out to be one of those dickeads who 'mistakenly' buy stuff and then contact you with flimsy excuses why exactly it was a mistake they wanted your article. I later sold it to Fabrizio D'Amico, who not only is a good vj friend, but also a main founder of the London video Hackspace. I sold it to him for not much more money, still it felt a lot better, karma-wise.